The Flatland Digital Artwork Clip Art Gallery: Tropic of Capricorn. ABSTRACT DIGITAL ARTWORK. 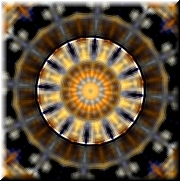 A kaleidoscope or mandala in colors evoking ancient South American tiles: teak, pale gold, deeper gold, and black. A sharply incised wheel with a central sunburst surrounded by a rim or corona in light gold and teak, with paddle-shaped rays against a darker wheel in black and dark brown with a khaki-colored rim. The background is very dark brown with details in pale silver.